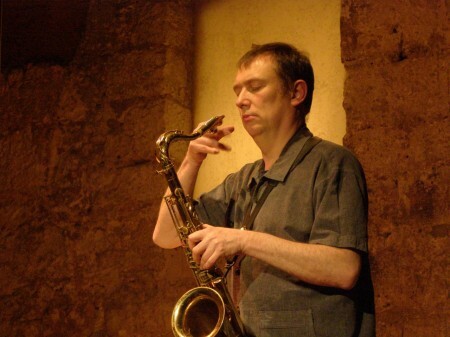 British saxophonist John Butcher has been at the forefront of redifining the instrument’s role and capabilities. Through his subtle employment of amplification, feedback, and electronics, he brings out a wide range of minute detail in the mechanics of breath, reed, pads, and metal and makes them available as the prime material of his exploration, along with the more “traditional” techniques of multiphonics, circular breathing, etc. Bay Area percussionist Gino Robair has an equally inquisitive approach to his playing, open to all sound that can be achieved by tapping, rubbing, scraping and pounding on anything within reach, often with electronic enhancement. Playing with everyone from Braxton to Zorn to Waits, as well as his own Splatter Trio, Robair is a major figure on the West Coast experimental music scene.